How does Play Octopus work? 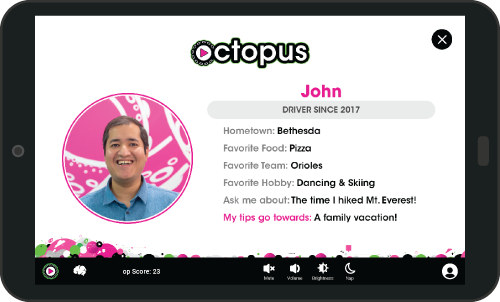 Play Octopus provides tablets to rideshare drivers that give over 100 rides a month. Riders enjoy games, prizes, driver information and other content. The tablets also run ads, which allow us to provide them for free and even compensate our drivers. Absolutely! But don’t ask us, ask our community. Over 80% of our drivers report higher tips or ratings, and a noticeable improvement in their driving experience. Check out this testimonial video to hear their favorite parts. Riders love the fact they can play games and win prizes during their trip. They also learn more about their drivers, which sparks friendlier conversations. The results show in higher tips and better ratings. Busy riders can easily put the tablet to sleep so as not to interrupt with work calls, cat naps, etc. Nothing, as long as you continue to drive more than 100 rides/month. We offset our costs by showing short advertisements in between games. As such, we need a minimum number of passenger rides/views to break even so we ask that you return the tablet if you drop below 100 rides/month. Yes! We reward you for driving and having passengers play the tablet, as well as pay referral bonuses for referring new drivers to our network. Full-time drivers can make $100 per month, plus referrals are worth $25 each. Apply today to learn more. How do you know how many rides I give? Each tablet comes equipped with an LTE cellular plan and thus GPS. We estimate rides based on where the tablet travels. Why do you need my debit card? We compensate you via direct deposit into your checking account. Also, if you stop driving and neglect to return the tablet, you may incur a tablet loss fee. Please note you can return your tablet and accessories at anytime to avoid any fees. What if the tablet is stolen? Tablet theft is extremely rare. In the event a tablet is stolen, please provide us with the related police report and we will waive the tablet loss fee. Does it matter which rideshare service I drive for? Nope, it doesn’t matter to us if you drive for UBER®, Lyft® or any other rideshare service! Where can I get a tablet? Just apply here! If you’re approved, we will mail your tablet and accessories. When it arrives, set up only takes five minutes. We occasionally offer in-person pick-up options to approved drivers. Apply for a tablet and find out how Octopus can help you.